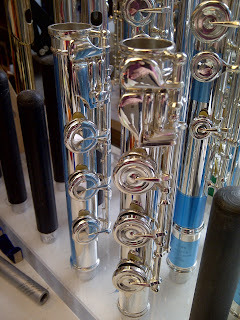 How do Powell flutes get so shiny? Well, one thing that certainly helps is the ultrasonic cleaner. Repair Technician Rachel Baker says she uses the ultrasonic cleaner for C.O.As, overhauls, headjoint cleaning, and tool cleaning. 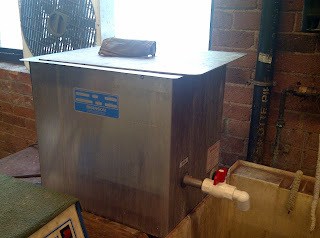 In addition to flutes in the shop for repair, new flutes are put through the ultrasonic cleaner as well. The ultrasonic cleaner is used with new flutes after they are polished, to get the polishing dust off. Rachel says the ultrasonic cleaner is "an absolutely fabulous degreaser" and is very versatile. So, just how does it work? Well, there is a gentle solution inside the cleaner. 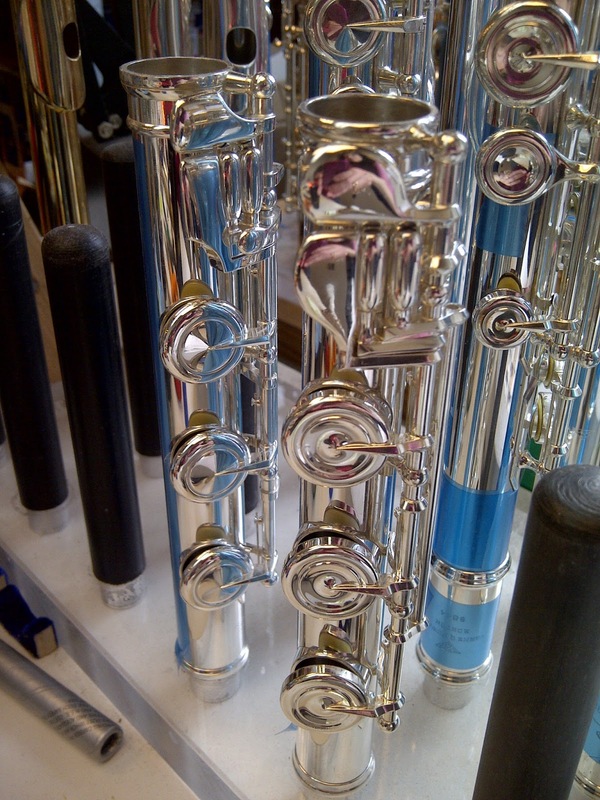 Ultrasonic waves are sent through the solution to clean the flutes. There is also a bit of heat produced inside the cleaner, which helps to disinfect. 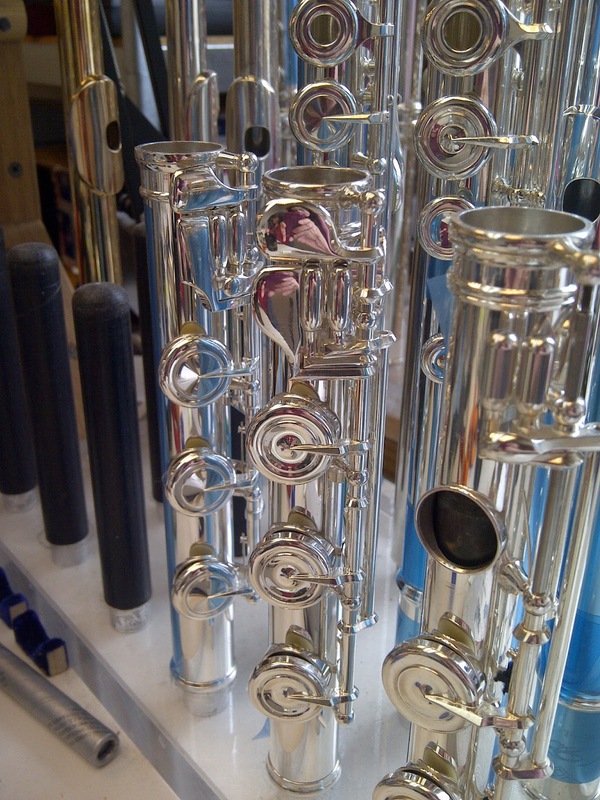 Obviously, wooden flute and piccolo headjoints and bodies are not put through the ultrasonic cleaner. 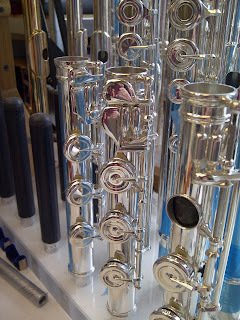 However, at Powell, metal flutes, headjoints, and keys can be cleaned this way. The keys are placed in a basket, and softer plastic separates the keys so they don't bump up against each other. Flute bodies are placed on long, cotton-covered rods with a hook on the end that attaches to the side of the machine. This allows the flutes to be "suspended" in the machine so that nothing touches them. A huge benefit of the ultrasonic cleaner is that it takes the place of harsh chemicals, which were used long ago to clean flutes. The ultrasonic cleaner is very safe -- no harsh cleaning agents are used at all. Also, the ultrasonic cleaner does not weaken the solder of the flute joints, so the flute joints will not come apart. The key to the ultrasonic cleaner is sound -- sound waves that keep new flutes and older flutes terrifically clean! It might not look like much, but this ultrasonic cleaner is amazing. Footjoints at the repair office. 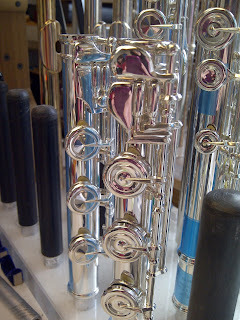 The middle footjoint has been polished and cleaned -- and we can see our reflection in the pinky keys! A closer look... We still see a reflection. Polished and cleaned truly to a mirror shine.